Registrations are officially open for the 2017 Toyota LandCruiser Country Music Busking Championships that will see hundreds of aspiring musicians line Tamworth’s iconic ‘Boulevard of Dreams’ in Peel Street for a shot at stardom. The championships are one of the Toyota Country Music Festival Tamworth’s most highly anticipated attractions, with hundreds of buskers set to take part in the always hotly contested competition. 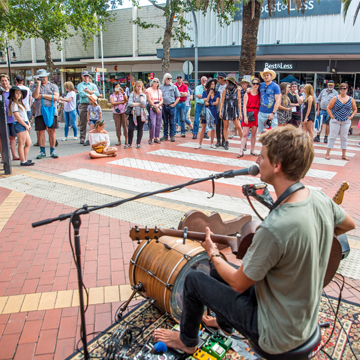 Many of those taking part will hope to follow in the footsteps of Troy Cassar-Daley, Kasey Chambers, Beccy Cole, and Keith Urban who all started by busking on Peel Street. A great launchpad for aspiring musicians, last year’s winner Mitch King went on to be voted the Hottest New Act at the 2016 St Kilda Festival, while last year’s people’s choice award winner Goldheist recently released her single and music video ‘Far Away From Here’. Registrations are currently open online at www.tcmf.com.au, with 10 finalists to be named during the festival from January, 20. Finalists will perform in Toyota Park on Saturday, 28 January and major winners will be announced on the night. All those taking part also have the chance to share in over $5,000 in cash prizes, plus an opportunity to perform at The Last Roundup on Sunday, 29 January in Toyota Park, and a guest appearance the following year on the Opening Concert in 2018. Tamworth Regional Council Manager Events Barry Harley said: “It’s one of the most vibrant and exciting parts of the Toyota Country Music Festival Tamworth and is an ideal springboard for up-and-coming country musicians or those who just want to perform music at Australia’s biggest music festival”. The event is proudly sponsored by Toyota, and supported by The Northern Daily Leader. The Toyota Country Music Festival Tamworth 2017 is being held from Friday 20th to Sunday 29th January 2017.